When Ryan the intern showed up a few weeks ago, it was unclear exactly what purpose he would serve. His entrance was highlighted to designate him as important, but then he lingered in the background for several weeks, knocking over a water cooler, enduring Sgt. Wu’s mockery—and if the show had kept up that long con any longer, it would’ve been frustrating to waste that kind of screen time. 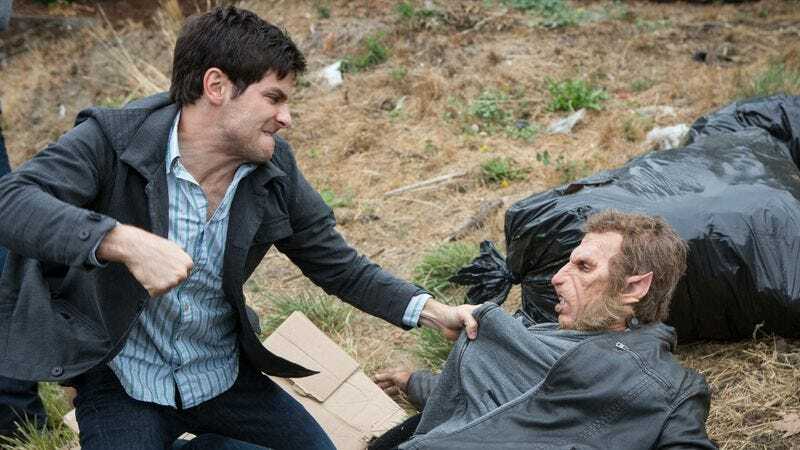 But even though I saw the twist coming a few scenes before it happened, I never expected Grimm to take the turn it did, in one deft move revealing Ryan to be a formidable villain for an episode. This is Grimm at its darkest and most in tune with how to blend Nick’s responsibilities as a cop with his hidden identity as a Grimm, and even with a handful of quibbles, it makes for a gripping procedural. During the first half of “The Hour of Death” I was ready to write about all the little things that still bug me about Grimm that are apparent in this episode. For example, in Buffy and Angel, vampires, demons, and other supernatural beings could blend in and walk among humans without detection, but whenever they showed their true form, everyone could tell. It wasn’t just Buffy who could see the vampires, but that’s not the case with Nick. Hank has to ask, “Was that a Wesen?” constantly and get confirmation. It’s obnoxious and repetitive. Or that press conference scene with Renard: we’ve seen these before, but they don’t really add anything to the show since how the police interact with the public has never been a focus of how Nick keeps his Grimm activities secret. Or the insistence of cutting from great scenes to completely irrelevant scenes—two examples tonight, one from the best scene in the episode to Renard calling someone in Vienna, and the other cutting from an arrest to a coffee shop. The key scene is Monroe explanation of the brand to Nick and Hank. Wesen have their own book of fairy tales, cautionary stories told to young children, and many of them involve horrifically violent Grimms. They roamed the countryside chopping off limbs and marking their kills—really just a lot of brutal killings, but they’re so ingrained in the minds of Wesen that once the mark shows up, it significantly hinders Nick’s investigation abilities. It’s a credit to Silas Weir Mitchell, so often the supporting MVP of this show, that even when he simply stands at a table, flips through a book, and talks at two other stationary characters, that he commands the screen, and the way in which he succinctly gives a Wesen history lesson kicks off the second half of a plot that only lets up intensity when it moronically shifts to a coffee shop sort-of date between Juliette and Renard. A few weeks ago in “Over My Dead Body” the show had its first resonant supporting character death, and once Ryan kidnapped Bud, I genuinely feared for his life. Bud is such a bumbling, delightful side character that it would be painful to see him tortured to death, and even though it was a bit obvious that Nick and Hank would get there in time, I did have that brief moment of doubt that Bud would make it out alive. I’m sure the ending will disappoint some people, and I’m not really sure whether or not I could stand another rival being stacked on top of the already overwhelming number of plot threads weaving in and out of every episode. But setting up Ryan to be another Grimm, then undercutting it at the last moment as a hideous unknown Wesen who just hates his true appearance did sap a bit of the thematic significance from the plot. There have to be people in the world of Grimm who don’t agree with how Nick is changing the natural order of things, and for Nick to encounter someone like that face-to-face is important, especially when he emerges victorious. Still, I’m content to just let “The Hour Of Death” stand on its own significant merit, powering through a boring first half to balance things out with a blistering and memorable second half. It raises questions about Nick’s methods as a Grimm, where he stands in relation to the standard order in the world he’s still discovering, and pieces together a tense and gruesome criminal investigation, despite a few stray scenes that distract from the overall dramatic effect. And ultimately, that’s pretty satisfying given that the show stumbled out of the gate this season. 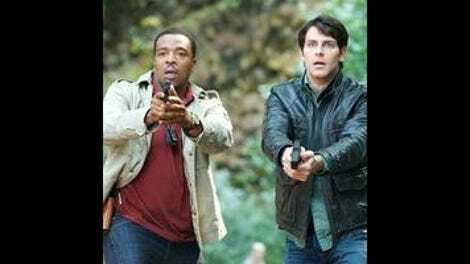 Will having Bruce Springsteen as a lead-in help Grimm from slipping too much in the ratings? Juliette and Renard: I honestly don’t really care that much about where this is going, but it’s going to stick around according to the promos. We’ll see if it gets better once Nick gets looped in on what’s going on. Bree Turner is sorely missed in these episodes, and I can’t help but wonder how much of what I perceive to be wasted screen time would’ve gone to her. I’m going to be on vacation for the final two episodes of Grimm this year, so thanks very much for reading, and I look forward to picking things back up after the midseason break.